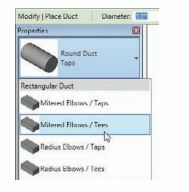 Ductwork, like pipework, is a system family through which Revit MEP can calculate airflow rates and pressure drops on any correctly defined system. Ductwork also provides the graphics for the traditional “drawn” documentation and the variety of ways this can be represented on a drawing sheet at different stages of a project, regardless of whether the duct is presented as a single lineat concept design or as a fully coordinated double linefor construction issue. There are three main types of duct: rectangular, round, and oval. These three types are the basis for your documentation, while new to Revit MEP 2012 are placeholder ducts (and pipes). the user can create supply, return, and exhaust systems with very little additional thought. During your implementation, however, you should also consider the benefits of creating additional duct types that suit the way you work and your company’s standards.